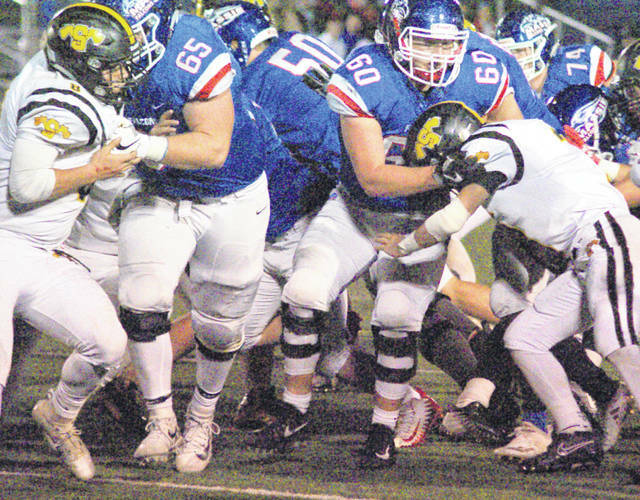 In the trenches, the Clinton-Massie offensive lineman (Matt Phillips 65, Seth Schmidt 50 and Seth Stiverson 60) overpower the Shawnee defense in last Saturday’s game. Clinton-Massie’s Region 16 semifinal game has South Central Ohio League written all over it. The Falcons (10-1) will play London (10-1) 7 p.m. Saturday in the second round of the post-season tournament at Miami Trace High School. Clinton-Massie, London and Miami Trace are all former members of the SCOL. The last time the two former SCOL rivals met on the football field was in 2012, the season Clinton-Massie won the first of back-to-back state championships. This season, KJ Price and Brennan Spiess are the Red Raiders 1-2 punch at running back. Price has had several huge games on the ground, including a 300-plus yard performance. Spiess is the thunder to Price’s lightning and has lined up at quarterback this season. Bricker Thiel is the top defender on London’s squad. The Raiders overpowered their 2018 schedule through nine weeks, outscoring opponents 537-130. The biggest win of the season for London was a 42-0 victory over Grandview Heights, a Div. VI playoff team. The lone loss for the Madison County squad was a 34-15 defeat at the hands of Whitehall-Yearling in Week 10. Whitehall-Yearling won its first Region 7 playoff game last week. The Red Raiders defeated Cincinnati Taft 37-21 in the regional quarterfinal round last week.